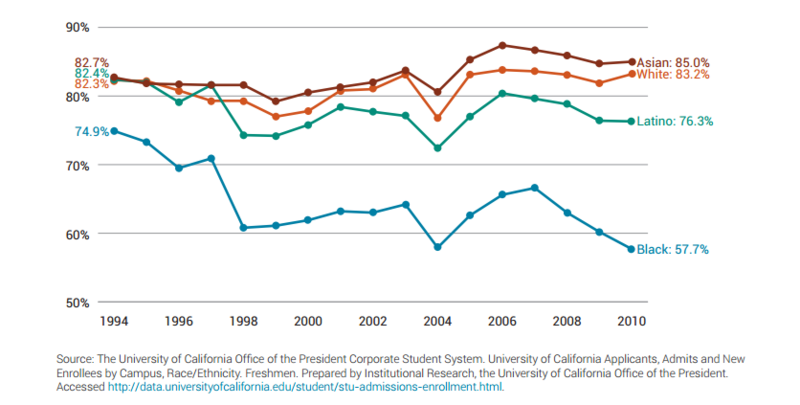 California prospers when students can go to college and succeed. And today, California needs significantly more students to cross the graduation stage in order to meet our economic and workforce demands. We have taken a bold step in addressing California’s looming workforce shortage by adopting a position in support of modifying Proposition 209 (the 1996 voter approved ban on the use of race in college admissions) to permit the use of race/ethnicity as one of many factors in weighing candidate’s qualifications for admission to our public universities. Our support for modifying Proposition 209 is about greater preparation, access and success for the increasingly diverse young people of our state. If California were to close the gap in college going and success between Latino and Black students and their White and Asian peers, 790,000 additional four year degrees could be produced, 1,150,000 more adults with the skills and education we need for the workforce would come from the community college system alone, and California’s personal income would increase by more than $135 billion by 2020. Allowing racial/ethnic gaps to persist is simply irresponsible and costly. We have been sounding the alarm that California will be on track to be a million baccalaureate degrees short by 2025 if current trends in college going and completion do not improve dramatically, 2.3 million short when we include community college certificates and degrees. Today, only about half of Californians who enter college will ever complete their educational goals. Exacerbating the problem are the persistent gaps in college going and success by race and ethnicity. Given that California is a majority minority state, there is no way for us to meet economic or workforce needs without ensuring students from all races and ethnicities succeed equally. California has a lot to gain when more of our residents earn a college degree. For every dollar the state invests in students who go to and graduate from college, it receives a net return on investment of $4.80. Few investments have the magnitude of such a return, higher education might just be our smartest investment. We will support a legislative effort to present California voters with an opportunity to ensure equal opportunity for a greater number of its residents. We will also continue to release reports on the State of Higher Education in California that highlight how California’s diverse students are faring, disseminate critical data to the media and policymakers, and mobilize our broad based and bi-partisan coalition to support this effort. California needs significantly more students to have access to higher education so they are prepared to help grow our workforce, economy and democracy. Tackling the barriers to college access and completion created by Proposition 209 that have permitted racial inequities is the right thing to do for California’s economic future. I hope you will join us. Click here to read our policy brief on the need to modify Proposition 209.